Examination of IRS data demonstrates the importance of various depreciation deductions for the construction and real estate sectors. These rules include the Section 179 small business expensing option, bonus depreciation, and normal tax depreciation. The data also illustrate what classes of property are most common, including the 5-year class for construction equipment and apartment property. This information is useful for the industry to consider as discussions of possible business tax reform take place during 2015. Some tax reform plans would increase the use of expensing, while others would extend depreciation periods, in some cases significantly. Claiming deductions for the depreciation of business assets is an important part of most enterprises’ income tax calculation. Tax law permits deductions that allow recovery of the cost of tangible property used for business purposes. These deductions reflect an allowance for the wear and tear of the property. Depreciation deductions also encourage reinvestment into older residential units. IRS tax data allow us to examine the use of these deductions by class of property and business sector. There are some important limitations however. First, the data examined in this post are limited to businesses organized as C Corporations. Thus, the data do not reflect businesses organized as pass-through entities, such as S Corporations and LLCs, which constitute the majority of real estate-related firms. Nonetheless, this smaller set of data can be viewed as a sample of the sector, with a bias toward larger businesses that organize as C Corporations. The second limitation is that the most recent data are from 2011. Unfortunately, the numbers reported by the IRS are typically published with a three- to four-year lag. With these qualifiers in mind, it is nonetheless useful to examine the kinds of deductions claimed by construction and real estate firms. Besides the impact on a businesses’ bottom line, many comprehensive tax reform plans involve substantial changes to how depreciation is claimed for tax purposes. Knowing the most important deductions is therefore important when evaluating these proposals. First, an important tax extender item involving depreciation is the Section 179 small business expensing option. “Tax extenders” refer to the set of expiring tax provisions that are typically extended as group by Congress. One of those items, Section 179 of the tax code, allows businesses to write off the full cost of placed-in-service business equipment. For tax year 2014, the expensing deduction is limited to $500,000 of equipment. The $500,000 threshold is reduced on a dollar-for-dollar basis for businesses that purchase more than $2,000,000 in business equipment for 2014. For 2015, absent additional legislation (such as another tax extenders bill), the 2015 section 179 limit reverts back to a $25,000 threshold that is reduced at $200,000 of equipment purchases. Section 179 has two benefits. It provides simplification for small business, by permitting immediate expensing. It also acts an incentive for business investment. 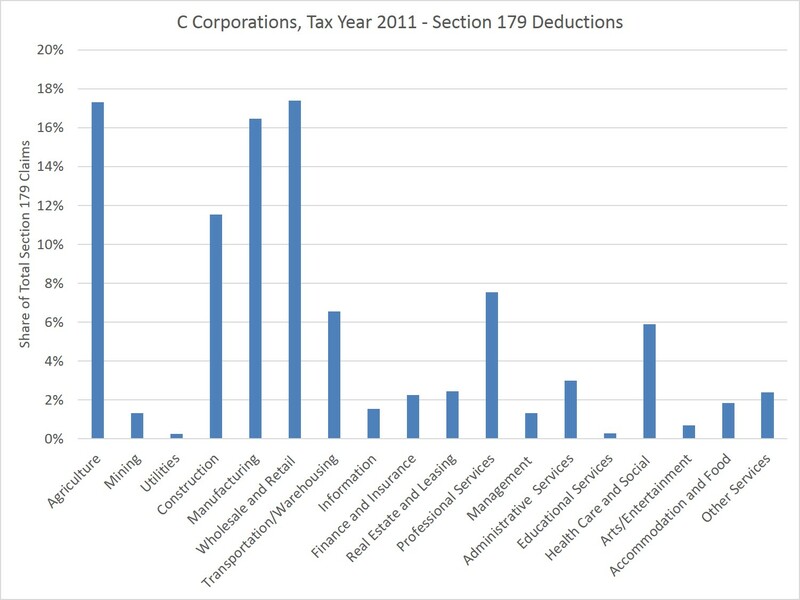 IRS data allow tracking the shares of section 179 deductions by C Corporations (worth repeating: no pass-thrus in this data) by sector for tax year 2011. Among the sectors for which Section 179 is important are agriculture, construction, manufacturing and retail. C corporation construction firms make up almost 12% of total claims ($8.4 billion for all C Corps combined). Other real estate and leasing firms make up only 2.5% of total small business expensing claims. A second important depreciation rule that has been subject to change in recent years is “bonus depreciation.” Under this rule, businesses may elect to claim immediate expensing on 50% of the cost of new capital assets in the first year of use. The rule only applies to new property and must have a life of 20 years or less, including certain nonresidential leasehold improvements. According to the 2011 data, bonus depreciation has significant benefits for construction and real estate, although to a lesser degree compared to section 179. For example, the data indicate that for all sectors of the economy, a total of $355.7 billion of bonus depreciation deductions were claimed. Of that total, $2.9 billion were claimed for construction (0.8% of the total). However, the share was higher than section 179 for the real estate and leasing sector, with $23.2 billion in deductions (6.5% of the total). The corporate 2011 numbers also allow examining the kinds of depreciation deductions claimed by type of property. 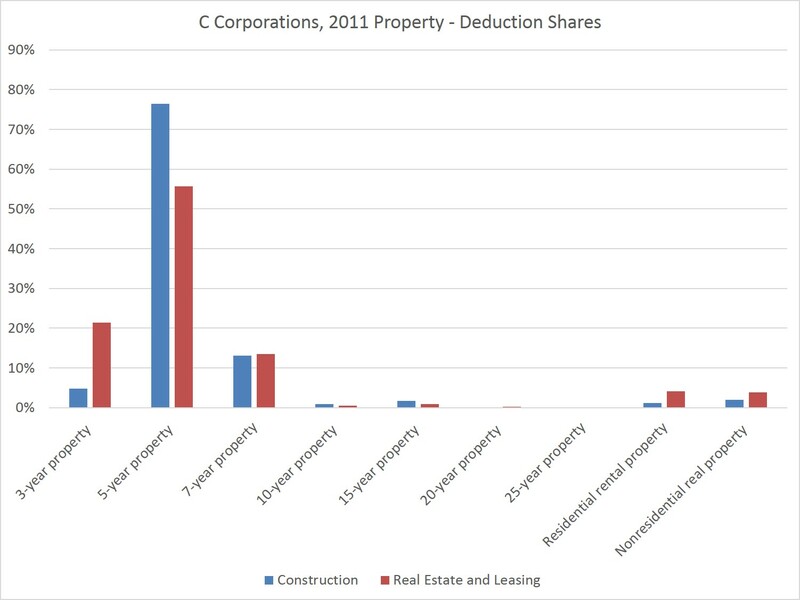 The chart above tracks the share of total depreciation claimed in 2011 by C Corporations by property type (under the Modified Accelerated Cost Recovery System) for newly acquired property. The numbers reflect the kinds of investments made in real estate and construction, although it does not reflect investments made prior to 2011, which respectively make up 89% (construction) and 84% (real estate) total deductions claimed in 2011. For 2011 investments, the 5-year class is the largest by share. This class includes cars, trucks, computers, and office machinery. It also includes construction equipment, for home builders, remodelers and other construction firms. And for owners of residential rental real estate, the 5-year class includes appliances, carpets, furniture, and other property used in residential real estate. Another important real estate depreciation category is the 27.5-year class, which is listed as residential rental property on the chart above. This category includes the actual building or structure of new residential rental property. Keep in mind that the value for this class was lower for tax year 2011 as it reflects depreciation claimed on buildings placed in service in that year, which was low due to the recession. Future data will show this share noticeably higher. Other notable property types include the 15-year category, which includes land improvements and qualified leasehold improvements for nonresidential real estate. Commercial real estate structures, including offices, building, stores and warehouses, are in the nonresidential real property class, which has a life of 39 years. The 7-year class includes office furniture. The 3-year class includes over-the-road tractors and certain rent-to-own property. While the data above are for C Corporations only, there are data sources on other forms of depreciation for real estate. Tax year 2012 data (one year ahead of the C Corp data) for individual tax returns (Schedule E), which include pass-thru business, indicate that a total of $70.8 billion of all forms of depreciation deductions were claimed for rental real estate. Additionally, Form 4562 data for tax year 2012 reports depreciation deductions for individual taxpayers by class of property. According to the IRS data, 4.317 million taxpayers claimed $64.4 billion section 179 deductions. This is much more than the more than $8 billion claimed by C Corporations in 2011. In contrast, relatively fewer bonus depreciation deductions were claimed by individual taxpayers: $10 billion (compared to $356 billion for C Corporations in 2011) claimed by about 1.5 million taxpayers. Form 4562 also indicates that there were $3.3 billion residential rental real estate depreciation deductions in 2012 claimed by 1.23 million taxpayers, although this includes both old and new property claims. Lastly, there is one other important deduction for real estate: depreciation of homes when used for business purposes. NAHB previously examined in detail who claims the home office deduction, including state, sector, and expense breakdowns, in 2014. According to the 2012 data, 1.7 million taxpayers claimed $1.2 billion in home-related depreciation deductions due to business use. Taken together, the IRS data illustrate the importance of depreciation for the construction and real estate sectors. It appears that 2015 could be a year in which tax policymakers give serious consideration to business tax reform. Depreciation could serve as a base broadener to raise revenue to reduce tax rates. This would be accomplished by extending depreciation periods to make cost recovery less beneficial. Alternatively, some tax reform plans move in the opposite direction, moving closer to an expensing regime, which would spur investment and increase tax simplicity.